You can give women and children a safer, healthier life to live. Poor health and poverty go hand-in-hand. 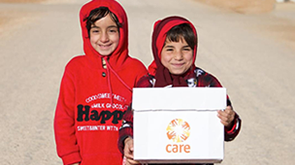 So CARE fights poverty by improving the health of millions of the world’s poorest people – particularly women and girls. By the year 2020, we commit to helping 100 million women and girls to exercise their rights to sexual, reproductive and maternal health and a life free from violence. Read our 2016 progress report on what we’ve achieved so far. Every child deserves the chance to live a healthy and secure life. Healthy mothers, children and families are the key to a better future for everyone. Every woman and girl has the right to make her own decisions about her sexual and reproductive health. HIV is more than just a health problem – it feeds a vicious cycle of poverty and injustice. Access to clean water saves lives – and frees women and girls from the daily burden of walking miles to collect water. Better hygiene and access to basic sanitation can save millions of lives every year.